A lot of people, myself included, have become convinced that the financial sector has grown way too big. A popular theory that is making the rounds on the internet and in ‘alternative’ literature is that there is a fundamental mathematical problem involving debt and interest. Two proponents of this theory are the animator Paul Grignon and freelance economist Bernard Lietaer. According to these theories, new money is mostly created as debt when private banks issue new loans. So far, the theory is compatible with mainstream economics. However, the theorists claim that there is a fundamental mathematical problem that makes sure banks will always continue to grow. The basic theory is that since the banks do not create new money for interest, a shortage of money will occur and it will be impossible to pay back both the debt and the interest. Thus, bankruptcies will be unavoidable and banks must always grow. Facing criticism that this does not take into account the fact that bankers spend some or all of the money they earn on consumption, Grignon updated his theory. He now claims that debts can indeed be repaid, but not if any borrowed money is re-lent, at least not unless the economy as a whole keeps growing exponentially. In this post, I attempt to show that this is simply untrue. Grignon’s updated theory only makes things needlessly complicated, and there is no fundamental mathematical problem. Consider the following sketch. This is a static system: there is no growth, no inflation, no new loans are taken, and no loans are ever paid back. It stays the same year after year. 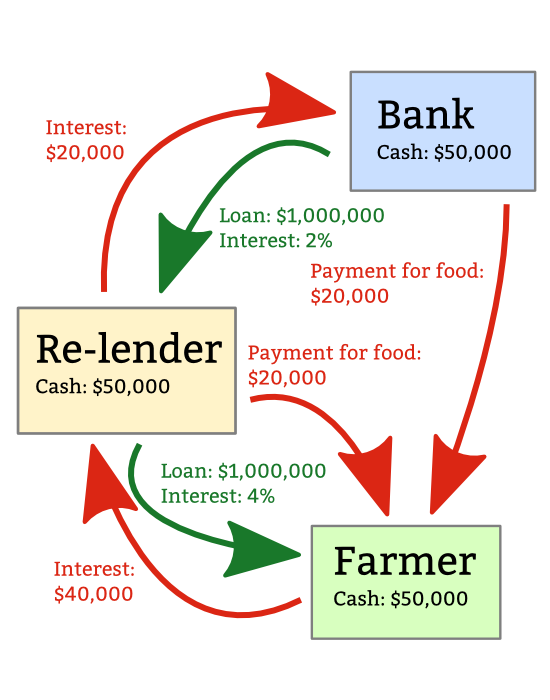 The green arrows represent loans, and they do not change. The red arrows represent payments. We can sum up the flows and see that everyone will end up with the same amount of money every year. Of course, we can see that this example seems unfair: the farmer produces food for everyone, while the others simply live off interest. But the example is not intended to be realistic; it is only to show that there is no mathematical problem with issuing loans for interest. The reasons for the growth in the financial sector are different and more complicated. I agree that Lietaer and Grigon got it wrong (don’t know if Lietaer has acknowledged that yet). I’m currently trying to debunk Lietaer’s “eleventh round parable” for a Positive Money group I’m in. I haven’t been able to find others debunking him besides you. Just one thing on your above post. In the second paragraph you say “He now claims that debts can indeed be repaid, …”. AISI, some debts can be repaid but not all, even without double lending. Don’t know if it’s worth pointing that out. Also, I don’t know off hand how much of the principle can be repaid. Something I haven’t thought trough yet. Regards, Louis. I’m quite convinced all debts can be repaid from a mathematical point of view. This would not be a good thing for society as people wouldn’t have money for investing in their life and businesses. And that’s why banks and loans (for interest) is a great idea: it allows people to spend first (hopefully on sensible things) and earn the money later. So that you can live in that nice house rather than being able buy it only after having saved all your life. The problem with banks, as I see it, is that they have become too big, they have too much political influence which means they are not regulated properly, and there is not enough competition between banks so they can charge people and companies too much. Yes, I agree debts can be repaid from a mathematical point of view, and in the “eleventh round parable” (once it’s corrected) it’s evident how to do that. In a real economy it’d be more difficult, but it’s somewhat moot as it’s unlikely we’ll ever need to. The positive money site lays out their proposals for a better system, so I’ll not repeat it here. One problem that some claim is the root of enforced growth of debt (and the boom bust cycle) is that banks are not spending all interest back into the economy but are hanging on to a proportion before re-lending it back into the economy. I don’t know if that is true but doing it year on year seems a bad idea to me. Well it is clearly true in the sense that banks are currently extremely profitable and are gathering more and more money. However, I disagree with the Positive Money people in that I do not believe the money system in itself is at fault. I believe it is simply that banks are not regulated properly and that there is not enough competition. I think the problem is similar to what happened a bit over a century ago in the US with the trusts that were eventually busted by Teddy Roosevelt. In a well-regulated economy, the interest should be equal to the banks’ costs for unpaid loans, personnel, buildings etc, plus a profit that should not exceed the profits made in other industries. So, thanks for the chat. The FSCS may have enough dosh to save one bank. But if one goes it’s a good chance others will follow, and we’re be bailing them out again.